Pre-War Zenith in a beautiful solid walnut case, one of only a few Zenith cases attributed to the Ingraham Cabinet Co. The case has been completely refinished with hand rubbed toning lacquers, and looks absolutely beautiful. The radio has a unique design where tube heat is released through slats in the case. The chassis has been gone over by a pro, and all tubes, resistors and capacitors that required changing were changed out. The radio is playing fine, picking up all my local AM stations. It has its "Z" knobs and "Z" dial pointer. 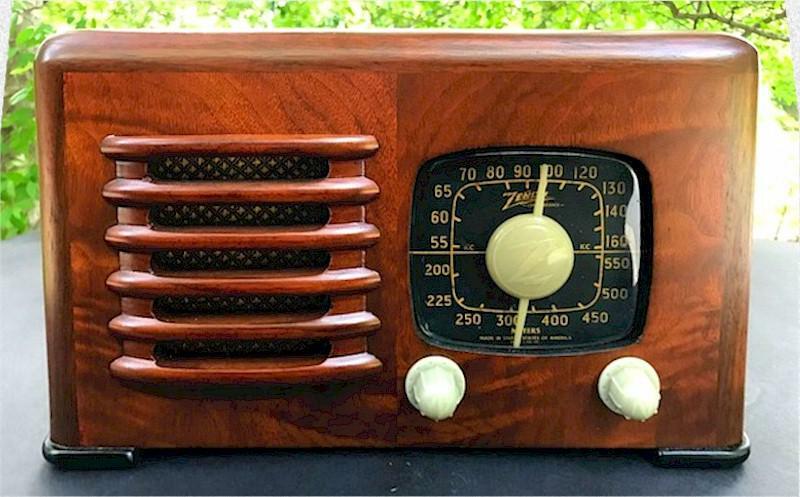 The radio has its original back, often missing. A nice black dial Zenith produced before Zenith switched over to war time production. About 11-1/2"W x 7"H x 6-1/2"D.
You are visitor number 703 to this page.